Ferreira, J. (2017) Has Britain Reached Peak Coffee Shop. The Conversation 30/10/2017. 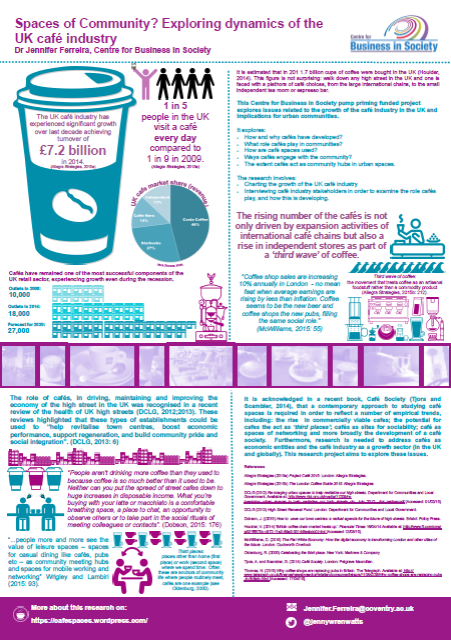 ‘Coffee shops and work: considering the coffice economy’. Faculty of Business and Law Annual Conference, Coventry University, Coventry, June 2017. ‘Exploring the journey from a research idea into research reality: inspiration to impact’. Coventry University Annual Conference, June 2017. ‘Co-working and the café’. Coworking Dynamics and the City Workshop, University of Leicester, March 2017. ‘New café society? Spaces of possibility’. Faculty of Business and Law Conference, Coventry University. June 2016. Ferreira, J. (2015) Spaces of Community: Exploring the dynamics of the UK cafe industry. Presented at the Faculty of Business, Environment and Society Conference, June 2015, Coventry University.